Thirty years ago Gunnlaugur SE Briem—Icelandic calligrapher, handwriting reformer, type designer and digital maven—edited a Special Calligraphy Issue of Visible Language (17.1). He has now followed it with The Briem Report: Letterforms 2012, which can be freely downloaded (as either a low- or high-resolution PDF). As before, he has gathered a wide-ranging set of contributions from colleagues throughout the overlapping worlds of calligraphy, handwriting, type design, typography and graphic design, that cover such topics as handwriting therapy for Attention Deﬁcit Hyperactivity Disorder, low-resolution hinting, watercolor illustrations, symbols carved into pebbles, wayﬁnding systems, typograms, smiley faces, grafﬁti and much, much more. The Briem Report, in sum, is a smorgasbord of lettercentric material, some of it fascinating, some of it beautiful, some of it self-aggrandizing, some of it boring—just as the special issue of Visible Language was. The contributors are not only from a wide range of disciplines, but they also come from around the globe: the United States, Ireland, England, France, Belgium, Italy, Greece, Spain, Serbia, Switzerland, Germany, Denmark, Norway, Iceland, Argentina, Iran, India and elsewhere. Briem’s ability to orchestrate such a gathering, a snapshot of the state of letterforms today, is truly impressive. 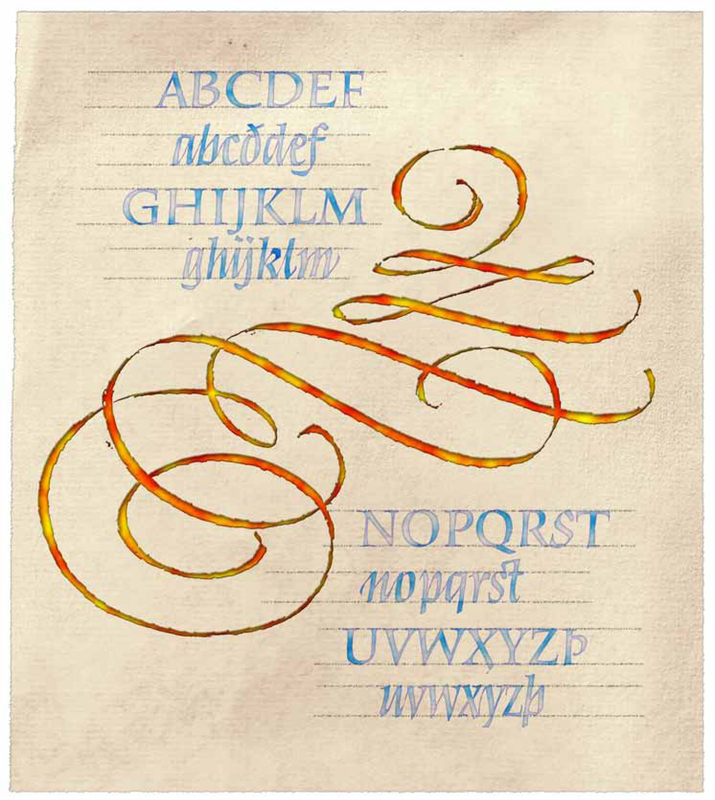 Briem’s distinctive cancellaresca corsiva—with a flourish. I contributed a set of variant minuscule gs to the Visible Language issue in 1983. But this time around, Briem asked me for a textual contribution rather than a visual one, speciﬁcally, a short essay on researching letterforms. My part can be found on pp. 186–187, but I urge anyone interested in calligraphy, lettering, type and any related arts to read and look at (and enjoy) the entire contents of The Briem Report: Letterforms 2012. You are sure to ﬁnd something eye-opening or awe-inspiring.